AUBURN, Ala. – Matt Insell saw some miscues in Ole Miss’ 83-60 loss to Auburn Sunday, but the Ole Miss head coach isn’t worried. He believes his team only needs to tweak of couple of things in order to get back on track. However, with three tough games ahead, beginning with Thursday’s contest in Oxford against the Tennessee Volunteers, and continuing with games on the road against No. 4 Mississippi State and at No. 5 South Carolina, Ole Miss can’t afford to waste any time in preparing for the remainder of its rough and tumble Southeastern Conference schedule. There are no two ways about it; Sunday wasn’t a pretty day for the Rebels as the Tigers’ defense forced the Ole Miss offense into some uncomfortable and unusual situations. Frequently, the Rebels didn’t have time to set up an offensive play due to Auburns’ mixture of defensive sets. The Tigers (12-5, 2-1 SEC) pressed full-court, and at half-court, including playing a little 2-3 zone. Auburn’s solid effort on defense forced Ole Miss into 24 turnovers, which led to 30 points for the Tigers. “We see that all the time. What they run in full-court, we do ourselves,” Insell said of Auburn’s offense. “We work against it every day. It was just carelessness, getting out there floating passes. It was a lot of careless basketball; we were not good at protecting the basketball,” he continued. 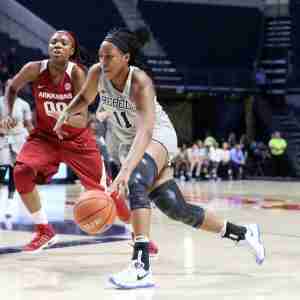 Foul trouble also played a part in Insell’s team not finding balance. The Rebels (12-4, 1-2) committed 15 fouls against an Auburn team that came in shooting 70.8 percent from the free throw line. On Sunday, the Tigers went 11 of 12 from the charity stripe, with their only miss coming from sophomore guard Erica Sanders. The Rebels’ last lead before Auburn’s early surge was 7-6 at the 6:08 mark of the first quarter; then Auburn got going offensively. Senior forward Katie Frerking sparked the Tigers’ offense with a baseline layup. Then, senior guard Brandy Montgomery drained the 17-foot jump shot. Shandricka Sessom’s layup cut Ole Miss’ deficit to 12-11, but an 8-2 run for Auburn turned into a 21-13 lead for Terri Williams-Flournoy’s group. The Tigers led by as many 15 points on three occasions in the first half and went into halftime with a 46-31 lead. Senior forward Shequila Joseph led Ole Miss with 16 points, including pulling down six rebounds. Sophomore guard Alissa Alston added 12 points on 5 of 7 shooting. The Rebels went 23 of 52 from the field and, at times, had wide open looks at the basket. But Insell doesn’t think Auburn’s defensive pressure caused a lot of those misses. In the final two minutes of the second quarter, Montgomery drained back-to-back 3’s on two straight Auburn offensive possessions. She finished with a game-high 25 points on 10 of 15 shooting to lead the Tigers. Janiah McKay added a double-double (13 points, 13 assists), and Frerking finished with 11 points, three rebounds, and three assists. As a team, Auburn shot 50 percent (32 of 64) from the field. Ole Miss has lost two straight games for the first time this season, but Coach Insell is not worried about his team’s position. Insell believes his team has it completely within its power to correct the mistakes that led to the loss. Ole Miss and Auburn met for the 57th time on Sunday with the Tigers now leading the series, 34-25. Auburn is 3-2 in the last five meetings. Auburn leads the series 17-8 in games played in Auburn. The Rebels haven’t won in Auburn since the 2015 season when Ole Miss defeated the Tigers, 51-46. Ole Miss hosts Tennessee on Thursday (6:00 p.m., SECN+). The Vols have won six of their last seven games. Auburn travels to Vanderbilt on Thursday (7:00 p.m., SECN+).